The Tigris like its baby brother Telesto descends from the Reference speaker Titan Tethys. The Tigris is a dominant and striking evolution of the uncompromising Titan series. Tigris is the result of 5 years intensive development and the natural continuation of the research that began nearly 25 years ago with Joseph Sahyoun’s dream of the perfect loudspeaker. During the development of the original Titan, it was recognized that the combination of individually uncompromising units failed to achieve the homogeneous perfection and true to life reproduction Joseph so ardently desired. The focus was then broadened from optimization of individual technical details to approaching the design as a complex, intrinsic organism. A new generation of devices and components had to be developed. Organically In-Circiut became the new paradigm at Earthquake. The drive units were developed in-parallel and designed to work harmoniously together. Mimicking natures organic growth as close as possible the drive units grew up together instead of being introduced to each other as adult strangers attempting to connect through a complex and diluting crossover network. Titan differentiates itself as everything is engineered from initial conception to work together. This improves all aspects of the design.The whole becomes greater than the sum of its parts. The result is a loudspeaker with constant energy dispersion. A speaker with no tonal shift regardless of volume. A speaker where detail is not achieved at the expense of dynamics. Titan Series straight through wide open performance sets a new standard for loudspeaker design. Titan Tigris - Challenge it. Titan Tigris´ exterior surface is made of deep luxurious black glossy piano lacquer. The elegant finish complements the iconic design and sculpturally adds sophistication and exclusivity to any home. Titan Tigris - more than sound. The cabinet construction is derived from time honored Scandinavian boat buildingprinciples. The Hemi Elliptical design reduces reflections and standing waves which ensures a transparent, dynamic and neutral reproduction. Typically cabinets with curved surfaces are made with router grooves in the wood so it can easily be bent. This is quick and efficient, but the disadvantage is a significantly compromised structural thickness as the grooves cut deep into the wood. The Tigris Hemi elliptical cabinet is built using the Earthquake proprietary N-Flex method. Layer upon layer of steam bent wood are adhered together with no loss of structural thickness and rigidity resulting in a superior cabinet. Each layer is in fixated for 60 min before the next layer is added. A uniform thickness of 30 mm is achieved by 8 layers of steam bent HDF (high density fiberboard). This thickness is constant and not compromised by grooves or foam. Each cabinet is built around an internal skeleton made of a unique wood and epoxy composite material. The combination of uniform thickness and strong geometric shapes results in an anechoic and incredibly strong cabinet. The finish for such a carefully crafted cabinet is a unique process requiring several stages. The cabinet surface is primed and sanded before multiple layers of black lacquer are applied. The cabinet is then finished with a smooth and deep clear coat that is masterfully polished. The result of this detailed and multi-step process is a smooth and soft, super refined finish that sets the standard for elegance. T1 super tweeter resides in its own Stilla-Sphere housing on top of Tigris. This location provides optimum dispersion, minimal interaction and a stable sound stage. Tx1 is phase tuned to work uniformly with the Super midrange Mx2. 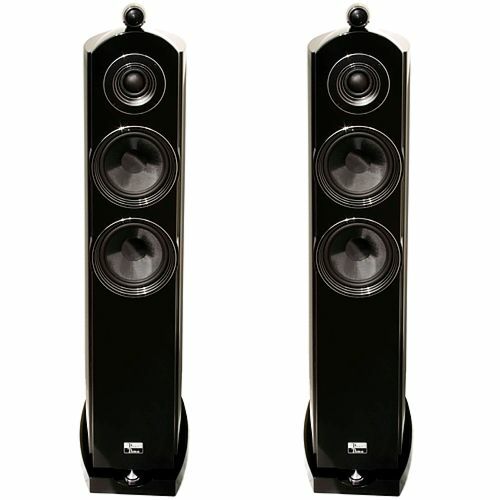 It has traditionally been difficult to get a separate super tweeter to work homogeneous with the rest of the speaker. This is overcome by the synchronous development of the drivers. Their dispersion and energy constant is synchronized so they appear transparent as one unit. Tx1 super tweeter is based on a silk dome diaphragm resulting in precise, soft and fatigue-free reproduction. The silk dome is Accumax coated which retains the excellent audio properties of pure silk while eliminating the mechanical break-up inherent in pure silk at higher frequencies. Tx1 has a very powerful motor system based on a rare earth neodynium magnet. This construction ensures a uniform and stable response and tonality regardless of frequency and volume. A special elongated version of Earthquakes Vortex cooling unit effectively removes heat from the tweeter motor system thus safeguarding against compression. 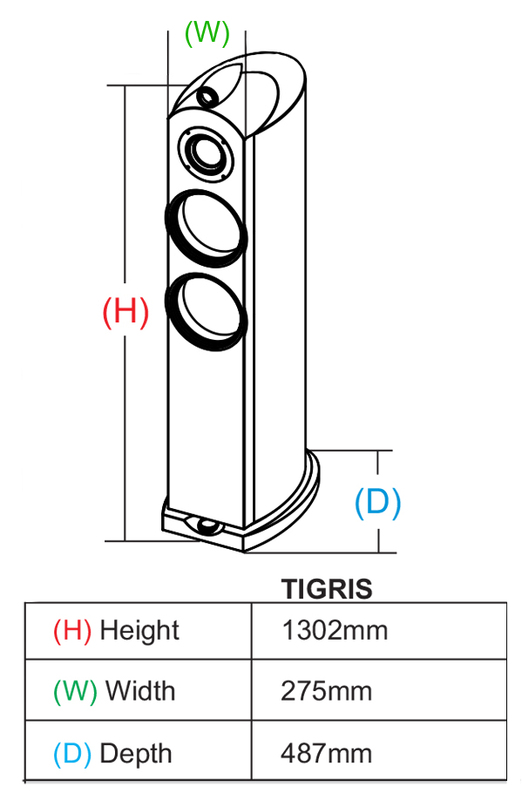 The unique Tigris Mx2 super midrange is the result of Earthquakes Laminar Flow Optimized Sphere Transducer Technology. Referred forth with to as “Ball-Loaded”, as the design has similarities with the shape of a sphere / ball. The advanced design solves several longstanding challenges in loudspeaker design. And its increased upper frequency response ensures perfect transition to the Tx1 super tweeter. The good sonic properties of a super tweeter is often difficult to integrate as traditional mid-tones are not fast enough or their dispersal pattern is different, leading to noticeable non-uniformity. The Mx2 super midrange special spherical shape is the result of extensive research into the causes of turbulent flow and the resulting acoustic artifacts of traditional high-frequency devices. To create a super midrange you must by definition create a device that has greater bandwidth than a conventional midrange. This means that it must be able to operate in a frequency domain usually reserved for a dedicated tweeter. The use of a conventional tweeter with a added separate super tweeter is very difficult to integrate in a homogeneous and true sounding unit, as both the electrical division of the signal and the units' acoustic properties can not be synchronized accurately enough. Fewer devices with higher bandwidth has better harmonic characteristics. Thus the use of one super tweeter and one super midrange is genetically better than a use of a midrange, a tweeter and a super tweeter. Several factors come into play when creating a midrange faster than traditional mid tones. The most well understood aspects of this equation are mass, power, self-resonance and stiffness of the radiating material. But there are more challenges than just increasing the weight / power ratio. Unit size with respect to its upper frequency reproduction creates some acoustic challenges. The importance of a units air compression and air impedance increases exponentially with the size and frequency. A drive units cone shape determines if the cone motion at a given frequency affects the air in a laminar way or creates turbulent air flow. It is essential that a drive unit translates its excursion into laminar air movement to avoid undesirable audible distortion. This type of distortion occurs if the cone surface cannot translate its movement to the air in a linearly way, thus creating a drag difference. This distortion occurs even if the device behaves pistonically, this phenomenon is not break-up related. Usually the problem is the transition between the cone-shaped diaphragm and the edge suspension. The air close to the edge suspension experiences a lateral displacement. The larger the angle difference between the membrane and edge mount the more pronounced is the problem. Many designs have an edge mount that sits 90 degrees on the diaphragm, this reduces the upper frequency limit before audible distortion / turbulent flow occurs. One obvious solution would be to eliminate the edge suspension, but the result is turbulent flow with negative pressure potential, since the absence of edge suspension creates a vacuum at the edge of the membrane instead of the pressure a steep angled edge suspension would cause. Earthquakes Ball-loaded Mx2 super midrange overcomes this problem by not having a transition between the membrane and edge suspension. The hemispherical membrane is double hung and flexes in two pivot points with very low-angle difference. The voice-coil attaches to the cone of the inner pivot point giving both the center dome and the outer circle pistonic and precise movement. This particular design has several advantages. The acoustic diameter is smaller than the real surface area which pushes the break-up frequency far beyond the audio band of the drive unit. The break-up point of a given drive unit is the material stiffness vs. diameter and frequency. The absence of transition between suspension and membrane allows laminar flow characteristics at very high frequencies. A differentiated Accumax coating of the pure silk membrane ensures that the diaphragm is rigid while remaining flexible at the pivot points. The hemispherical shape of the cone ensures a spherical dispersion consistent with that of the Tx1 super tweeter. Mx2 sits in an optimized shallow Audio Lense Pod increasing the coupling to the air and the sensitivity. Through optimization and strict control of air impedance in the Lens Pod the optimal air coupling is achieved without tonal shift or hardness. Its fundamental design elements eliminate problems that traditionally have been tried solved by way of refinement. Here they are genetically removed from the design resulting in a detailed and completely compression free sound - so unhindered and shackle-free that sound exits the speaker almost as if it was lightening. It is an uncanny sensation when you find yourself blinking at the onset of transients as the body's natural defense mechanism takes over, detecting that this is “real” and something is coming your way - impact imminent. Kevlar was invented by the Dupont Corporation in the early 60s and have been used in loudspeakers for many years because it is light, rigid and anechoic. These advantages come with their own set of challenges, Kevlar is expensive and difficult to integrate which is why you often see a low-grade Kevlar (low-thread-count) used in loudspeakers. By using a low-grade Kevlar most of its special properties are lost. The Bx-8 woofers use the highest ballistic grade Kevlar. The cones are lightweight and extremely rigid guaranteeing pistonic behavior far beyond their crossover point. Kevlar is an aramid fiber and is very sensitive to moisture and absorbs moisture if not specially processed. The Kevlar cone constructed by Earthquake undergoes a special epoxy evaporation process making the Kevlar invariant to moisture. The Bx-8 utilizes high Santoprene surround suspension and the special Earthquake Super Spider unit. These design features results in impressive diaphragm throw potential. Several unique benefits arise by the use of the XLT (Xtra Long Throw) architecture. At typical playback levels only a small portion of the large throw potential is needed, the unit can be designed so that the suspension compliance is unchanged within the unit's nominal travel. It overcomes any kind of CMS compression found in typical drive units. The Unit's suspension is so compliant that it easily moves when lightly tabbed by a finger. Traditional subwoofer units with similar excursion are clumsy, heavy and hard to move. An over-sized copper voice coil with a winding height of over 4 cm combined with a massive strontium-cobalt magnet system provides a strong electromotive interaction which keeps the unit in an iron grip. This means that it is always the electrical impulse that controls the cone. It ensures that the distortion caused by mechanical self-braking will never arise. The Tigris bass response stays accurate and taunt regardless of complexity and listening level. TIgris is equipped with 2 Bx-8 bass drive units in a Vertical Line Array setup. The Line-Array configuration optimizes the radiated energy and concentrates it within the desired dispersion field. The properties of the vertical line array are reinforced by the special Earthquake SCALA pods (Shallow Concave Audio Lense Apparatus). The Audio Lense pods guides the sound, this dispersion control ensures the most accurate integration of the drive units. Typically, a speaker is designed and optimized by being taking measurements of the on-axis response with a single microphone. This means that a single microphone placed in front of the speaker is the primary feedback the designer has to work with apart from subjective listening tests. The human hearing is always in stereo, even when the sound is coming from a mono source. Sound is always perceived and interpreted as a differential of the sound picked up by both ears. It is not enough that a speaker measures well on-axis with one microphone. For development of the Titan series, Earthquakes engineers built a complex sound analysis computer that simultaneously receives and analyzes input from 21 microphone pairs. The microphones were arranged in a half circle in front of the speaker, measurements of the entire sound field could now be made. Early in the development phase it became obvious that a speaker that measures perfectly on-axis, could be far from good when measured just 10 degrees off-axis . Re-imagine your expectations with Titan Tigris. 1 1/3" silke dome super tweeter with Neodynium magnet. Dual 8" Ballistic Grade XLT Kevlar woofers. Frequency response : 25 - 40.000Hz. Recommended amplifier power:100 - 700 Watt.